Satirical and ironic, Stikki Peaches’ works invite you to pause, analyze, and will likely leave you feeling nostalgic. Originally from Montreal, his singular style is as popular in galleries as it is on the walls of the world’s busiest metropolises. His father a tailor and his mother a designer, Stikki Peaches’ first creative endeavors were in fashion design, an industry that deeply influenced his artistic practice. As a child, he was surrounded by sketches and drafting patterns, which he happily collected, reassembled, and transformed with paint and pencils. 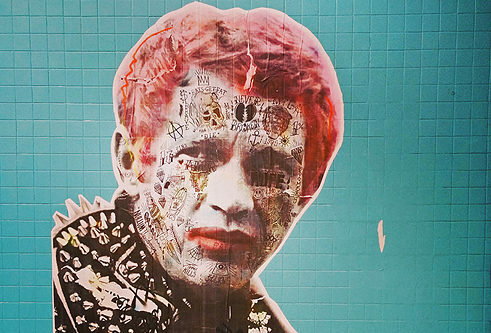 His style is rooted in this spirit of reusing and recycling, where a myriad of techniques are combined to reveal the influential figures of his childhood. His vibrant compositions feature mythical characters, political leaders, and cultural icons: Batman, Elvis Presley, and Mozart coexist, creating a startling juxtaposition of themes and aesthetics. Stikki Peaches sees art as an escape, an outlet that allows him to move away from what hinders his growth as an artist and as a human. His tagline "What if Art Ruled the World?" fits this context. This question echoes the artist’s stance, suggesting that conflicts and disasters affecting our society would have no basis if the world was governed by art. Through his works, Peaches invites the onlooker to contemplate the effect and importance of art. His practice aims ultimately to democratize it: by taking his practice to the streets and incorporating pop culture references, Stikki Peaches distances himself from elitism and abstruseness often associated with the contemporary art world. Striking, colorful, and iconic, his pieces are well suited to digital culture, which values bold visual content. The Montreal artist’s works are found in various private collections in the United-States, Europe, and Canada. Since 2013, Peaches steps out of the studio to participate in Mural Festival, an annual event celebrating graffiti art in Montreal. In 2016, his piece entitled MO.Z. was selected to adorn Romeo Gin’s first edition of bottles. His works were also featured during a special event at the Musée national des beaux-arts du Québec.